However, knowing your general audience and their interests helps compose ideas and mark a place to start. Let’s say you were writing a post for Bluewire Media. You could use Buzzsumo to see what type of content has done well. A post on “how to repurpose static content” did well, getting over 300 shares. At this point, we may not know the greatest title for it, yet we know repurposing content is something Bluewire Media’s audience wants to know about and share. Next, we begin thinking of a title, something that will engage an observer. Great information has been published about the psychology behind viral content and writing click-worthy titles in recent past. These are great ingredients and his post explores them in-depth, but for our purposes here, let’s focus on number two and consider why a person is on the Web in the first place. They have some sort of need to fulfill or problem to solve, whether it’s information, like, “How do I write great titles?” or transactional “Best hotels in Seattle”. Since an internet browser may be doing just that, passively looking for information or transactions, you want to entice their interest further. Copywriters do their best to focus on the benefits and not the features of a particular service or product. For example, an ergonomic chair is a great purchase because it helps avoid back pain and promotes better posture, not because it incorporates the latest in physical therapy research. We’ve all seen sensational headlines and thought about grabbing a magazine off the rack while waiting in line. But a common scenario includes being intrigued enough by the headline, grabbing the news item off the rack, going to a particular article, and finding you’ve been duped. The grounds for the headline are illogical, impertinent to the subsequent story, or absolutely false! 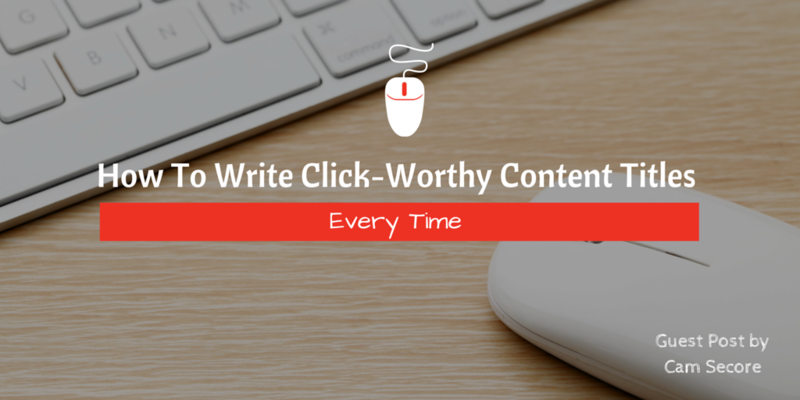 While stirring emotion and being controversial are ways to attract click throughs, you need to be sure the actual content can substantiate the headline. Sensational headlines inspire pogosticking, the act of clicking through and quickly off the page in search of a better answer, engaging content, or plain truth. Newsjacking is the act of riding the coat tails of a current event or hot topic. When something major happens, it is common to want to provide readers with knowledge. But, let’s face it, if you’re not an expert on the topic or directly involved, your post is among many. The Super Bowl was on February 1, the (*cough) deflategate “scandal” was heavily discussed in May, and recently, Brady’s “acquittal” along with the start of the new season made news. If you’re not ESPN, Roger Goodell’s diary, or Tom Brady’s destroyed cell phone, it’s going to be hard to get online attention at these times. Yet, that should not totally deter you from the act of newsjacking. Depending on your service or product, you may use the main topic, Tom Brady, for other purposes. In addition to using Ubersuggest to generate ideas regarding what people are searching for, you could use Word Clouds. We can assume all of the names and terms are related to Brady, the main topic, yet the smaller the size of term, the less interest (and likely coverage) the angle received. Lastly, when producing content, you want to be timely, especially when so much is out there. In an analysis of 100,000 random posts Moz and Buzzsumo found over half had less than 2 Facebook shares and two-thirds got zero links! Fighting a gluttony of content, you want individual pieces to fare as well as possible. This means paying attention to when, what, and where you publish. Many publishers are in the habit of publishing on all social platforms once content is published on their own site. However, it’s important to note which social networks share your content the most, the variety of content shared, and when it’s happening. For example, Bluewire Media’s content does best on Twitter every day of the week. Publishing midweek on Bluewire Media seems to produce the most shares. LinkedIn does best, relative to the other networks, on Monday, and Facebook shares are non existent during the weekend. What does all this mean? You should probably publish cat pictures. On second thought, I think that horse has been beaten and placed in a cemetery along with SEO. So, while generating topics and titles, consider the above dues, why people are interested and want to click through, and don’t fall victim to being sensational, one of many or going off-topic. The bad news is that there is no magical answer. The good news is that people’s interests are always evolving, and with the right tools, timing, and creativity, you can find and modify your publishing sweet spot. Cam Secore’s currently blogging at AllPowerMoves.com. This isn’t his first rodeo. He went from selling felt pencil pouches, in first grade, to selling electronics on eBay. Once he got to middle school, he started making his own websites. Read some of his reviews, or follow his journey here. He’s also a huge sports fan, so hit him up on Twitter if you have any hot NBA takes.